– Plant, S. (1992) The Most Radical Gesture. London: Routledge. http://www.digitaldrift.net was a web art project created around the turn of the millennium. It was produced as the major practical project work in submission of an MA in Media which I undertook in 1999, as well as serving as a vehicle through which to draw together and present a range of ideas and film, video and digital media work i was engaged in and producing at the time. It was an opportunity to learn and explore web authoring practices, hypertext narratives and design, as well as examine the fledgling world of online video and the associated issues in presenting moving image material on the internet. 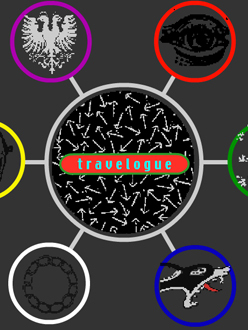 The opening pages of the website (pictured above) introduce the background ideas informing the work, and which the work seeks to explore, by means of a Flash authored roll-over menu system revealing the various texts, via the ‘travelogue’ link from the main navigation ‘hub’. The hub intended to link to past, present and future projects – hence the 391 and Fabricata Illuminata sections leading off from here. The main body of the website is the 33 degrees link, which takes the viewer to a maze of interconnected pages, featuring graphics, symbols and numbers; image, sound, text and video. Notions examining the situationist ideas about Psychogeography and dérive within a virtual environment are central to the work. Hypertext navigational systems also open up the narrative possibilities for chance encounters, cut-ups and collages of information and ideas as the internet explorer clicks from link to link. The visitor to the site constructs a different narrative with each visit. The confusing and ambiguous nature of the symbols connecting each page make it difficult to remember where they have already been, and it may take several visits before they encounter all the information and pages available. Each time they create a new route through the information, a new script, a new edit, a new psychogeography, a new cut-up, their own table of correspondences. The veiled allegories and symbolism of Freemasonry, Jewish Mysticism, the Tarot, Hermeticism and Tantric Buddhism become themes to be explored. 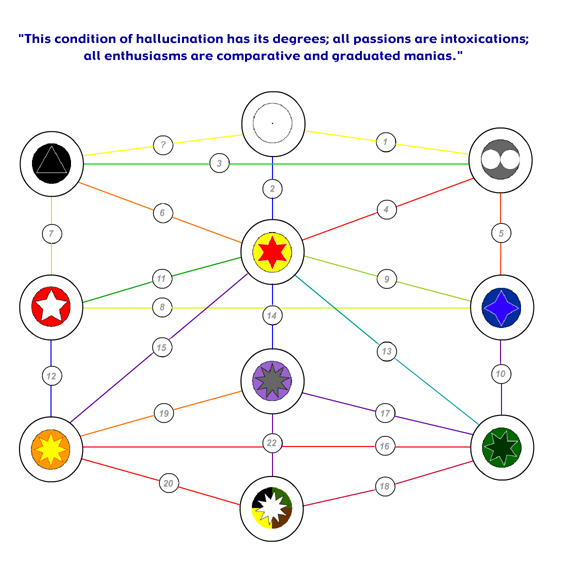 The Kabbalist’s Tree of Life becoming a framework to structure a network of pages and connections. Discussion, collaboration and the sharing of research, reading and ideas with my old friend and collaborator Martin King were instrumental in realising this project. Each ‘node’ of the network becomes a theme of ideas, explored in text, image and sound. Key nodes have video content, intended as thematic to the pages they inhabit, and to play their own role in the hyper-narratives that online navigation creates. The severe restrictions on video content, at the time of creating the website, meant that the embedded clips had to be heavily compressed into small file sizes in order to play at all, via slow networks and modems. As a consequence the online quality of this material was very low, and the image sizes very small. Revisiting this material over a decade later, means that it can be presented and viewed online in far higher resolution and quality. Taking the video clips out of the context of the website and placing them in a narrative sequential order, counters the original intentions of embedding each clip/section within a website, but does however bring alive embedded meanings and juxtapositions, within a timeline narrative, and acts as an indicator of the wider themes explored within the website they collectively represent. Very happy for you to do so. I look forward to checking your site out too! You actually make it seem so easy with your presentation but I to find this matter to be really one thing which I think I’d never understand.